Jill Johnson (Camilla Belle) is a teenager looking for a little extra money through babysitting to pay her extravagant cell phone bills. Taking a job for a rich couple in their luxurious, isolated home, Jill settles in for an easy evening in a cavernous location. Trouble arrives with a seemingly prank phone call that urges Jill "to check the children." What starts as harmless fun soon erupts into violence, with Jill fighting for her life against a mysterious killer in unfamiliar surroundings. 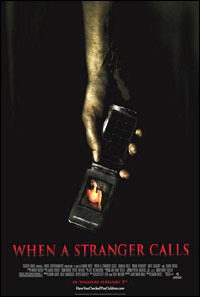 Not surprisingly, "When a Stranger Calls" is a remake, this time of a 1979 chiller that starred Carol Kane. The story is a simple exercise in suspense filmmaking, and the producers have updated the script to include more modern touches, since the world of telephones hasn't been all that frightening since Bush Sr. was in office. One might even suggest that this idea has been rendered obsolete in an era of caller ID and "star 69." But that doesn't stop director Simon West from paging through every thriller gag in the book. A lousy filmmaker ("The General's Daughter, "Tomb Raider"), West is trying to make so much out of absolutely nothing here, with long passages of "Stranger" dragging by without anything occurring. Sequence after sequence simply finds Jill entering a room, getting spooked, and leaving the room. For 90 minutes West repeats this formula with shampoo-direction-like skill, reminding the audience that they've paid to watch an insignificant filmmaker try to drag out a 5-minute idea into a feature length movie. "Stranger" would be a lot more effective if West had more of an imagination. Instead, the film is yet another round of spooky cats, rumbling sound effects for no reason, and jump scares to keep the audience awake. At the center of all this nonsense is actress Camilla Belle, who essentially has to carry the entire film on her frail shoulders. Belle showed disarming promise with last year's "The Ballad of Jack and Rose," which teamed her with Daniel Day-Lewis. Sadly, it seems as though the performance was a fluke. Belle's limits as a performer shine like the morning sun in "Stranger," with the actress not able to register fear convincingly. Bell is stiff when she should be scared, and looks mildly agitated when she should be panicking, relying on West to bring out the depth of horror her character should be experiencing. He's the last guy any actor should put faith into. Since the entire film follows Belle as she moves endlessly from room to room, peering through windows and answering the phone over and over, "Stranger" suffers greatly in the suspense department due to her limited range. Tacked with a lame hospital coda that is simply there to make sure the production has met its contractual running time, it appears "When a Stranger Calls" isn't aspiring to be much more than a slumber party curiosity to be rented over the next year. In a just world, teenagers will see the garbage that Screen Gems is trying to shovel down their throats with "Stranger," and ignore it like they would a concerned parent.